This will undoubtedly be a controversial post, but I like to think it could also be seen as a good instructional on how to make something practical (dare I say useful) out of an book of debatable value. It’s my attempt at public service. I know, I know…you’re welcome! So the way I see it it’s obvious most people ,especially most of the Bible’s most devout “true believers”, have never really read their their blessed best seller. What with all of the divinely sanctioned torture, genocide, slavery, global scale interspecies mass murder, and cannibalism who can blame them right? It’s quite obvious the book is an incoherent collection of superstition, bigotry, misogyny, and general ignorance that nobody really wants to read…which is *exactly* why this is the perfect practical repurposing of project for something like this. What’s better is the Bible is a book you can reasonably expect to find in almost every American household and neither you nor any visitor would ever imagine pulling it down off the shelf to read it. It really is the perfect place to hide something in plain sight. Now obviously those with a Christian Taliban mindset will protest that this desecrates their “holy” book. If I’m honest I suspect they could probably make a compelling case. I prefer to think I’m just cutting out the bad parts (albeit a bit imprecisely) and making something much more valuable in the end. Obviously it was part of God’s divine plan that I should create something this awesome for you, so yeah, thank God. 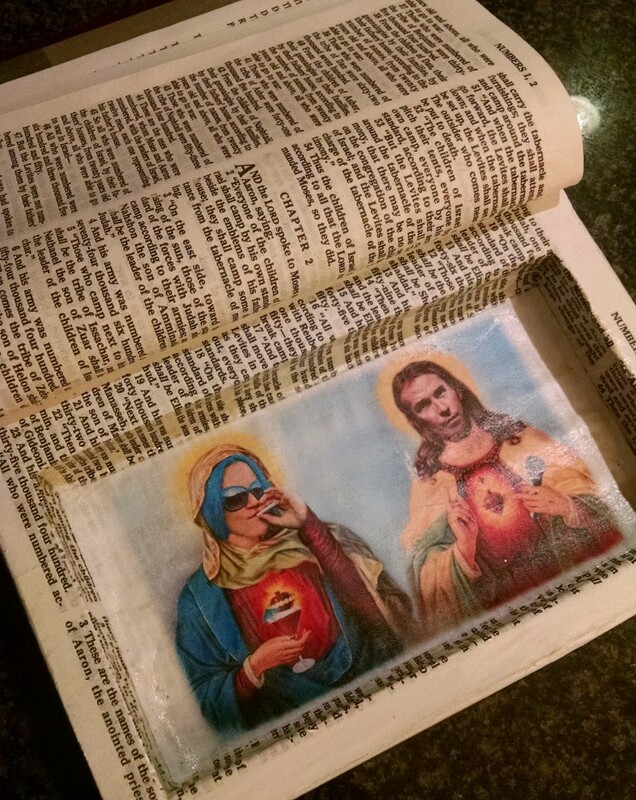 So without further ado, here is how you too can make your very own Super Jesus Bible Box. Optional: Three to Four wood clamps or “C” clamps. Step 1: Get a Bible It’s possible you have a Bible laying around your house already but it probably belonged to your Grandma so it has some sentimental value. The best alternative option is to get one for free! Luckily if you’ve ever stayed at a hotel there is usually a fresh never-been-opened Gideons right there in the nightstand for you to take. Don’t feel guilty, when you take that Bible literally nobody will miss it, and you’re helping overcrowding in the world by freeing up very valuable space in the nightstand drawer. Of course if you’re not a frequent traveler you can always buy an authentic Gideons’ Bible stolen on your behalf from comedian Doug Stanhope. Obviously you’ll have to go to one of his shows to buy it at the merch table but even so still I highly recommend this option because he’ll also autograph it for you (which is very thoughtful). Of course you can use another book instead but I would strongly advise against that because no matter what it is there’s a chance someone someday would actually want to read it. Okay you certainly could do this to a copy of the Quran or the Torah, but don’t do this to any other book because we’re not monsters here, you wouldn’t want to ruin a book that’s actually useful. 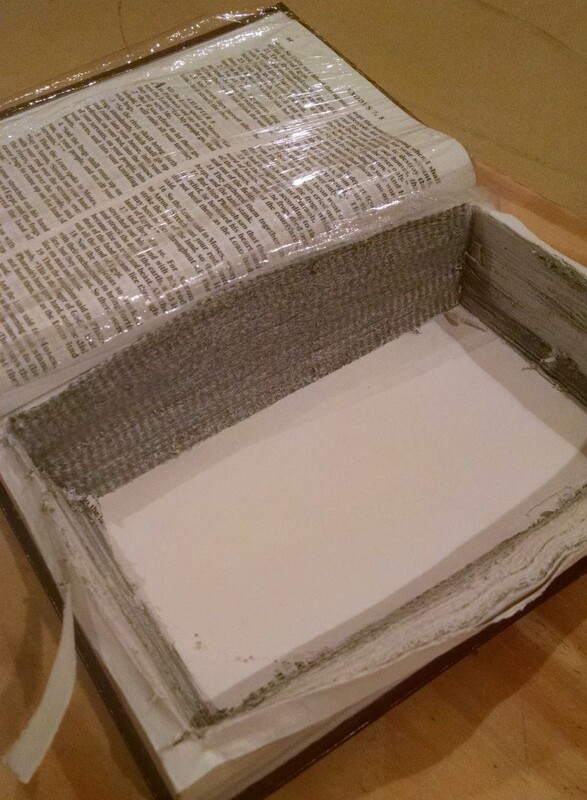 Step 2: Wrap it You’ll want to keep the first book of Genesis and maybe a little of Exodus preserved in page form so the book can be opened and shown to be what appears to be a fully functioning no secret compartment containing Bible. 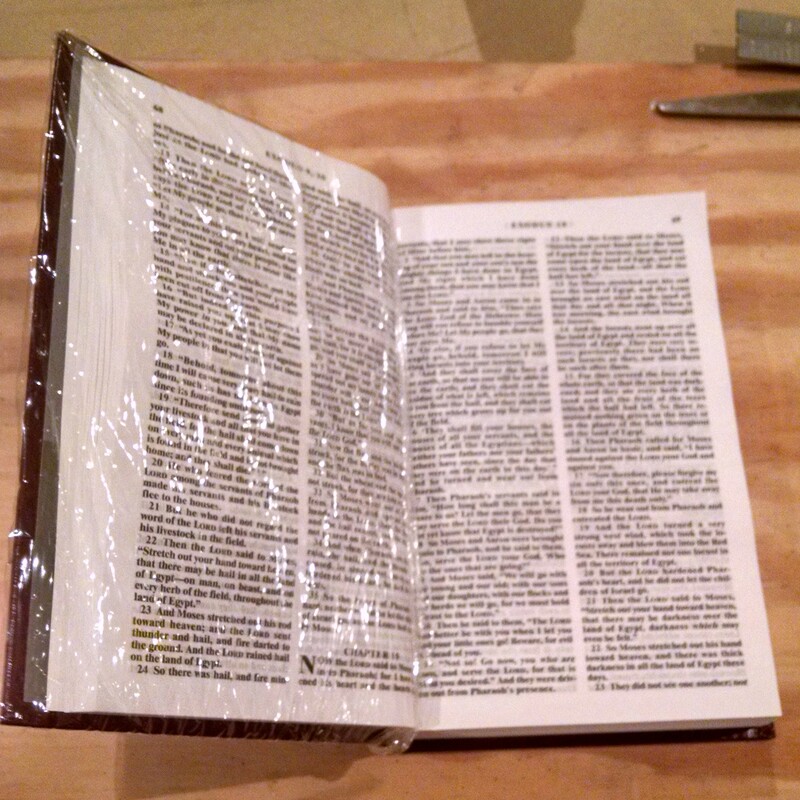 Just take some saran wrap and cover the cover and pages to be preserved. Now would also be a good time to carefully remove a specific page from elsewhere in the Bible that you can use later as the bottom of your book. For example if your name is Mark or Luke or Habakkuk you might want to cut out that cover page and save it for later. Or not…there are other great options too. Step 3: Glue up the outside walls of your box Using a brush or sponge apply a smooth but liberal coat of white Elmers glue to the outside edge of the unprotected pages and let it dry. 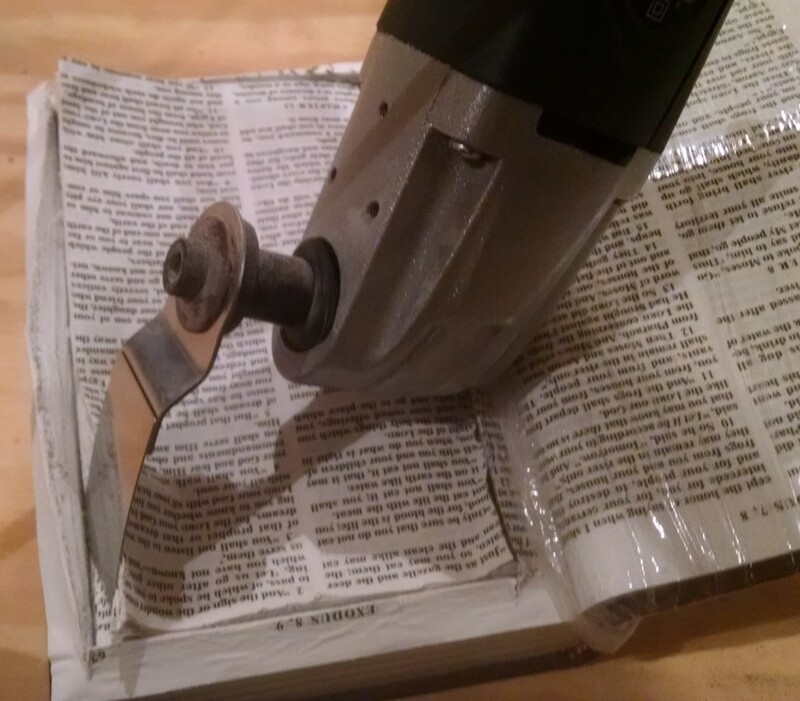 You may want to put something heavy on the book to hold the pages flat and tight while the glue dries. You may also want to do another coat or two of glue after it dries just to make sure the outside of your box is nice and solid. Be sure to rinse your brush clean when you’re done because you’re going to need it again later. Step 4: Cut out the box So the traditional method for cutting out the pages is by using an exacto knife or box cutter. I’ve done this before and it’s surprisingly hard work and the easiest way to develop carpal tunnel ever devised. You should do it by hand at least once so you’ll truly appreciate how much better an option it is to use a plunge cutter like this one here. Yeah, I know, you’re welcome (again). Step 5: Fix the sides At this point your hands are a little tired but you hopefully have the void of your box cut out all the way down. Nicely done! However you may now also notice your book doesn’t close very well because the pages get a little puffy and irregular where they’ve been cut. Yeah, you didn’t do anything wrong it just does that. No fear, the next step fixes that. Again get your sponge or brush and apply a liberal amount of glue to the interior sides of your box. It’s fine if you get glue on the bottom and top facing of the page too but we really want good coverage on the sides. 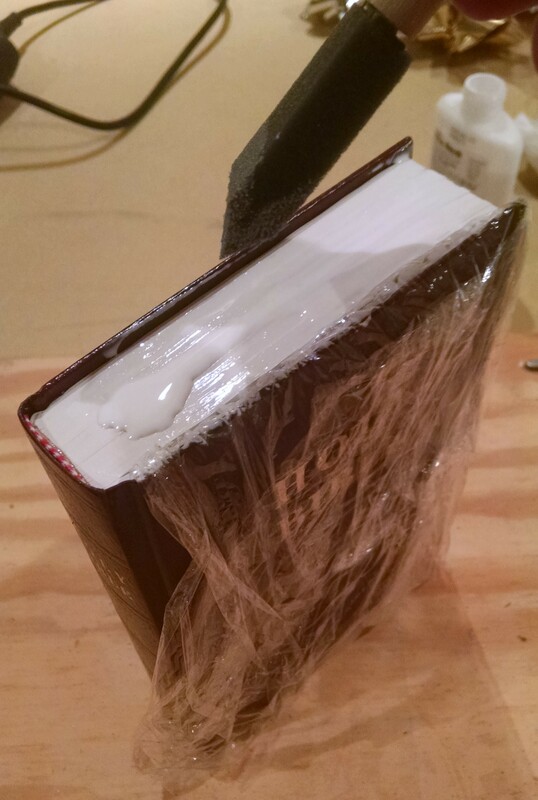 Once everything is covered well you can remove the saran wrap from the first few chapters, close your book as normally as possible, place it between two pieces of strong plywood, and use three to four clamps to compress your book flat again. 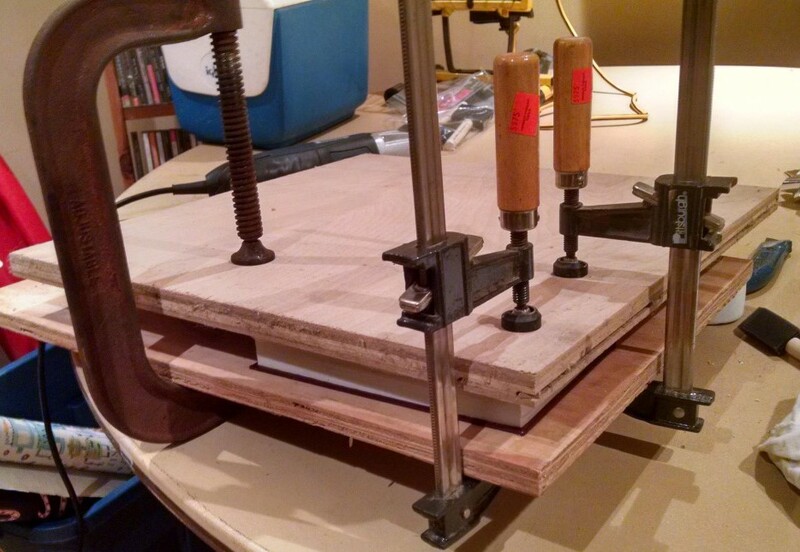 If you don’t have clamps you can probably just place something heavy like a couch on your plywood/Bible sandwich, but the clamps really will give you the best results. Be careful not to over tighten the clamps though or you could deform the spine of your book and that would be bad. Let this sit and dry overnight. Step6: Dress the sides Once you unclamp your book it should look nice and flat again. When you open it you’ll notice one or two pages are now glued over your opening. This is a good thing. Take your box cutter and make a cut right down the center of the page and then make two additional cuts along the top and bottom edge of the void. This should make a cut in the shape of an uppercase “I”. Fold the flaps back out of the void and apply a thin coat of glue to the interior edges and bottom of the void. Now simply bring the cut page flaps into the void and press then smooth to cover over the sides. Now we still need to dress the top and bottom edges of the void so put some glue on the top of the page and bring another page down on top. Repeat the above procedure except make your cut in the shape of an uppercase “H” this time. This will give you flaps to dress the top and bottom edges. We’re almost done now. Step 7: Dress the bottom Now you have some options for covering the bottom of your box. You can choose to use the page you salvaged earlier or you can get more creative and put a picture of your own creation there. Either way just cut it to size and glue it in. 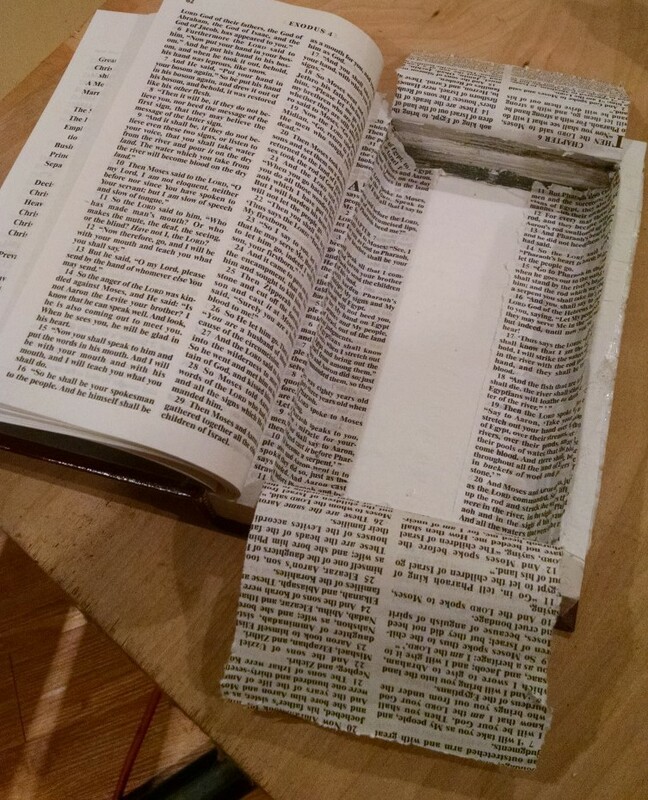 You can optionally put another thin coat of glue over everything inside the void of the box just to make it a little more durable, but once all the glue dries you’re now the proud owner of your very own Super Jesus Bible Box. Awww yeah, who’s your savior now? Happy stashing!